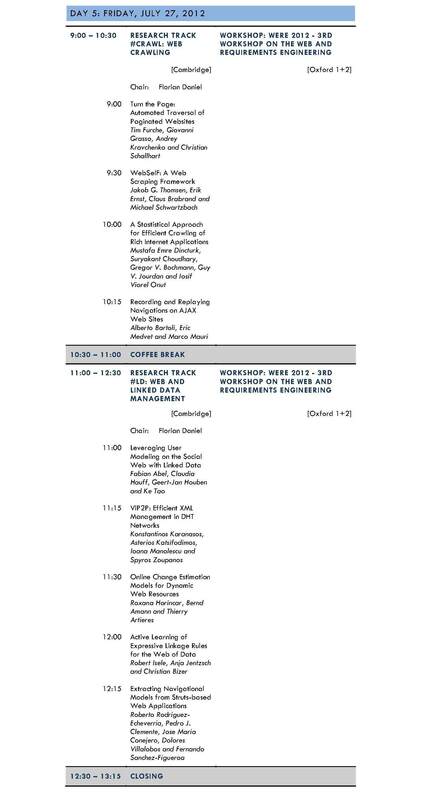 Details about the workshop topics and the URIs of workshop homepages are listed below. ComposableWeb aims to bring together researchers and practitioners with different research interests and belonging to communities like Web Engineering, Service Engineering, Business Process Management, Databases, Semantic Web, Software Composition, and Software Engineering and to advance the state of the art in the areas of web mashups, lightweight composition, and service-oriented computing. The workshop particularly aims to stimulate the discussion of key issues, approaches, open problems, innovative applications, engineering practices, and novel trends. What will be the future of Web development? Web Engineering is a specific domain in which systematic development is needed and therefore approaches such as model-driven and agile development can be successfully applied. Existing model-based Web engineering approaches already provide methods and tools for the design and development of most kinds of Web applications. They address different concerns using separate models (navigation, presentation, workflows, etc.) and come with model compilers that produce most of the application’s Web pages and logic based on these models. In practice, however, most of these Web Engineering proposals do not fully exploit all the potential benefits of Model-driven Engineering (MDE), such as complete platform independence, metamodeling, and model transformations. The MDE paradigm offers advantages such as technology independent models and (partially) automatic generation of applications, but also well-known problems as maintenance of the models. Thus, there are defenders of MDE and also defenders of alternative paradigms such as agile development processes. We want to raise a lively and constructive discussion on pro and cons, and how in practice we can benefit from both a MDE and an agile development process. Find some responses at the workshop! Following the Internet trends, we want to focus the workshop on two main topics and how MDE and/or an agile process could help in the development, evolution and maintainability of social Web and social enterprise apps as well as multi-device, mobile and rich Web applications (RIAs). 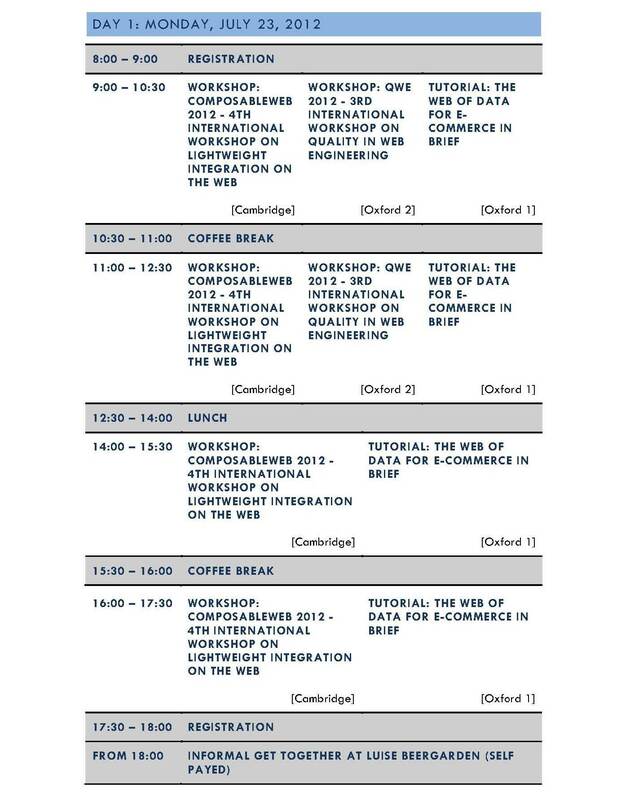 The International Workshop on the Web and Requirements Engineering (WeRE) intends to be an international event for exchanging ideas on both using Web technologies as a platform in the requirements engineering field, and applying requirements engineering in the development and use of Web applications. 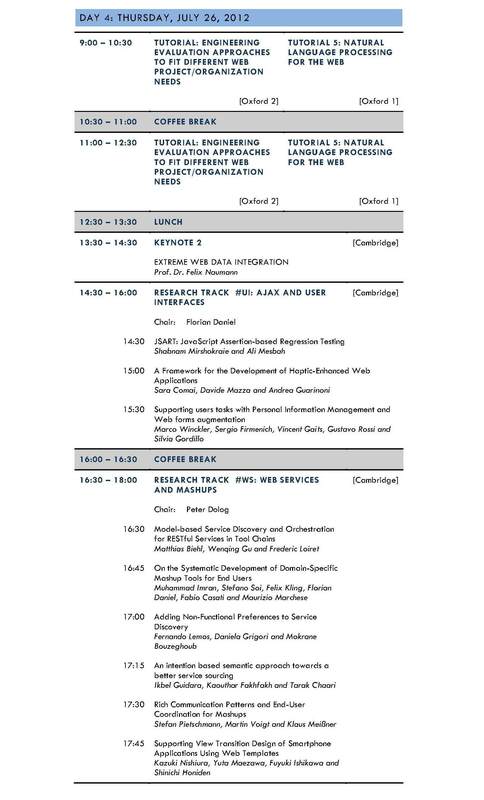 Papers focused on new domains and new experiences with the connection between requirements engineering and the Web are also highly encouraged. 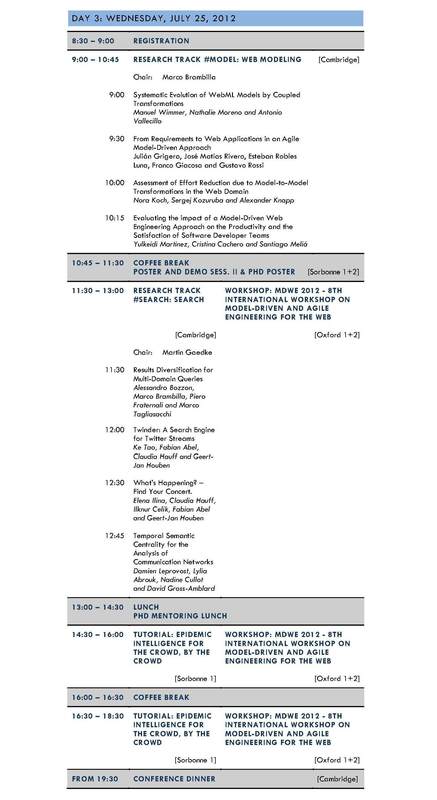 The workshop will be a forum for researchers, designers, and users who are related to the combination of these two main topics. The main objective of the workshop is allowing participants to discuss and get to know the most innovative and advanced experiences for guaranteeing the quality of Web applications and content, and the role that Web Engineering methods can play in this task. This includes, among other aspects, focusing on the way in which Web Engineering methods can be further empowered by taking into account quality principles and by integrating sound quality assessment techniques that have proven their effectiveness (review guidelines, usability models, usability evaluation methods, usability checkers, accessibility verifiers, information quality tools, logging tools, automatic metric capture tools, statistical tools, etc.). The workshop will particularly try to encourage the discussion on new emergent issues related to current trends in the creation of modern Web applications, commonly referred to as Web 2.0 applications.